To mark Depression Awareness Week we want to offer help to anyone who loves/cares for someone with depression. When your friend/partner/family member has depression you may feel confused and frustrated yourself. Perhaps you are worried anything you say will be taken the wrong way and therefore feel like you’re walking on eggshells. Or perhaps you feel your words carry no weight, so you stop trying. Depression is an incredibly isolating condition. Because of this it can sabotage relationships. What is important to remember, however, is that your support will always be significant. Below we look at some ways you can show support in the right way. Simply being there for your loved one may sound a simple enough task, but you’ll be shocked at how much this means to someone with depression. Listen to how they feel, without judgment. This will help them feel more connected, which is an essential way to overcome the isolation that accompanies depression. Many people with depression feel as if their problems aren’t worthwhile and may bottle up their emotions. This can lead to a lot of negative thinking, which goes on to fuel the depression. Encouraging them to talk about how they feel will let them get those emotions out, and help avoid bottled up feelings. If they do not feel comfortable talking to you, encourage them to talk to someone else – this may involve them going to the doctor or arranging a consultation with a counsellor. Sometimes it’s easier to talk to someone objective. It can be all too easy to think ‘oh, they’re going through a lot right now, I’ll leave them to it’, but this is probably the worst thing you can do. Arrange to meet up with them and call often, shying away will only increase their sense of isolation. If they say they need some space – give it to them, but send the odd text or even a card to show them you’re still thinking of them and will be available to talk when they feel ready. Telling someone who is depressed that they need to ‘cheer up’ or ‘get over it’ can make the situation worse. This implies that they have a choice over how they feel and that they can choose to not be depressed – and this isn’t the case. 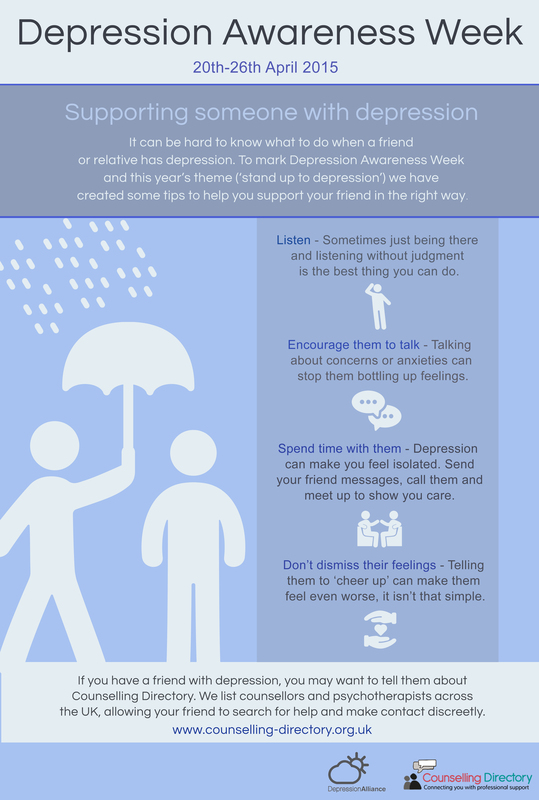 To help support Depression Awareness Week – please share our infographic on Facebook and Twitter. If you think your loved one would benefit from counselling, you may want to show them how Counselling Directory works. Here they can search for a counsellor and arrange a consultation, starting their journey to overcome depression. To find out how you can get involved in Depression Awareness Week, please see the Depression Alliance website.